A friendly and highly professional crew of six will attend you while on board: captain, helmsman, steward, cook, engineer and your certified bilingual naturalist guide. The guide will accompany you to all visiting sites within the National Park, providing a wealth of knowledge about the geological and human history of the Islands, and of course about every aspect of their intriguing flora and fauna. Because of a deep concern for the conservation of these Enchanted Isles with their increasing population of close to 25,000 people (2006), The Beagle’s management endeavours to use locally produced goods and services, maintaining its main offices in Puerto Ayora on Santa Cruz Island. The Beagle has been awarded the Smart Voyager certificate, which is granted to tourist operations after careful inspection of their adherence to sound conservation practices. The Galapagos Islands are located on the equator of the Pacific Ocean. The Intertropical Convergence Zone (ITCZ), known by sailors as the doldrums, is the area encircling Earth near the Equator, where the northeast and southeast trade winds converge. This situation frustrated many pirates, buccaneers and whalers alike who sailed to Galapagos in search of fresh meat and water. Unfortunately, this phenomenon affects The Beagle’s capacity to use sails as the main form of propulsion to travel between the various sites on our itinerary. 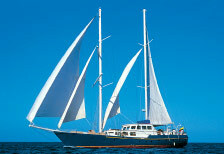 When wind conditions, wind direction and bearing are favorable, rest assured we will use sails. We do raise our sails to stabilize the ship during longer navigations, these generally occur at night when most guests are sleeping. The Galapagos National Park is a highly regulated nature reserve. These measures are in place to protect and conserve the unique wildlife and landscapes of the archipelago. For this reason, all live-aboard vessels in the Galapagos Islands have an itinerary that is regulated and controlled by the Galapagos National Park Service, which is monitored via a GPS beacon. The goal of the itineraries is to minimize the number of visitors at any given moment on each site. The itinerary imposes times and effectively the navigation direction between sites, which are not always favorable for sailing. Nonetheless, we were able to design The Beagle’s itinerary, to incorporate at least two diurnal crossings which have good conditions for sailing. So, you can enjoy the experience of wind in our sails.